Nadia Janjua is a visual artist, architect, creative entrepreneur and an art educator who has been teaching elementary and middle school level art instruction in private tuition, homeschooling, and community group settings. She received her Bachelor of Fine Arts degree from the George Washington University in 2000, and her Master of Architecture degree from the New Jersey Institute of Technology in 2005. The diversity of her backgrounds and her love for artistic discovery and expression have led her to focus on helping others develop their creative confidence, as well as discover the joy of the creative process. 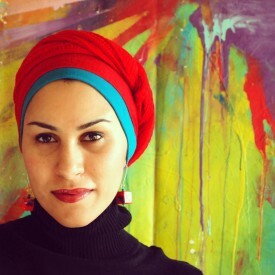 Nadia‘s teaching approach is heavily based on process-oriented art and open-ended exploration of materials and techniques. Facilitating and guiding art experiences in Nadia’s class will encourage Tarbiyah Academy students to be excited and open to new possibilities in thinking and decision-making. Knowing that they can make mistakes, explore and experiment, will also foster their special ability to invent, create, and find innovative solutions to real world problems in the future. Contact Ms. Janjua at njanjua [at] tarbiyahacademy [dot] org.